Recently I have been using this fabulous body cleanser… I’m really loving this brand! It’s called what’s in it for me? It has the freshest packaging you will come across. Trust me, you’ll love it. Basically it’s all about self love. We all need that. 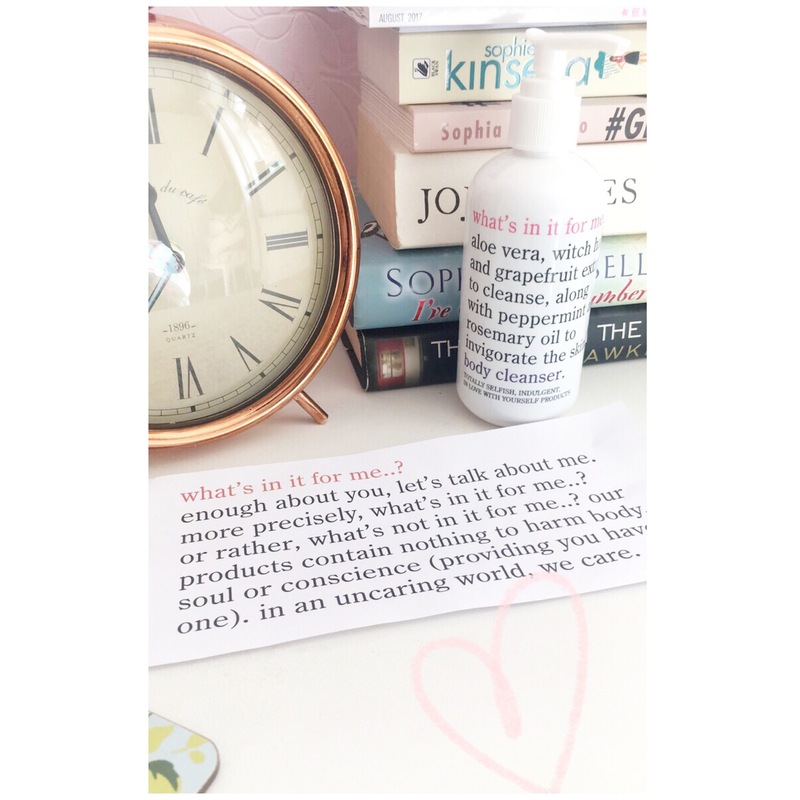 What’s wrong with being selfish when it comes to skincare?! We all love to pamper ourselves & look after our skin. I opted for the body cleanser as I loved the scents in this. It smells UH-may-zing. So I only use about 4 pumps per time, which is a sufficient amount. Plus how good is that? Hopefully that means it won’t just run out after a week 💁🏽 I love using this when I have a bath 🛁 it makes the bathroom smell soooo good. It contains aloe vera, witch hazel & grapefruit extract for a fabulous cleanse. Plus peppermint & Rosemary oil 🙌🏽 so many goodies for your skin in there. It has the perfect consistency, as I hate using cleansers that are too runny or too thin. It just seems like you have to use so much more when they are. I think the added touch for me is the fact it’s in a pump dispenser. Makes it super easy to use. Has anybody else fallen in love with this brand yet?